Today we finally got on our way to Tokyo. At the Sendai station we were waiting for our train arriving on time as usual. Wow! This time we were really lucky. 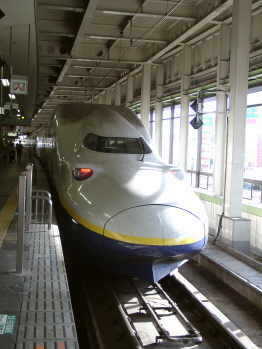 The modern MAX Super Express `Yamabiko` should bring us to the megametropolitan Tokyo. With a top speed of more than 320 km/h it took us in appr. 2 hours to our destination. We barely felt the speed inside the comfortable compartment. Only when passing one of the many tunnels we felt strong pressure in our ears. 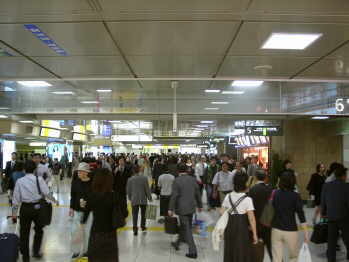 At Tokyo main station we tried to find the right way to the exit. Although we knew that some 20 mio people live and work in this area, we were quite amazed by the huge number of people at the station. We experienced a place that was far more busy than Atlanta airport in its busiest time. 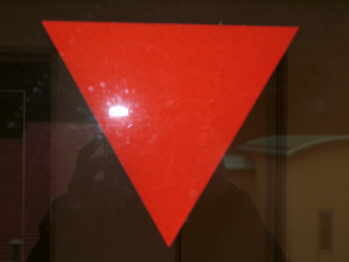 Once we exited the station, we recognized something was different - compared to good old Germany -. Noone bumped into us ! 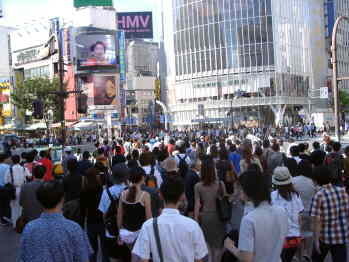 This barely happens here at all - as Japanese are polite enough to slow down rather than risking to bump into anyone. 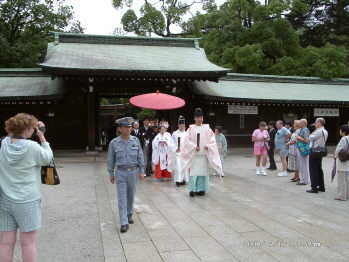 As a cutural highlight we choose to visit the Meiji Shrine - one of the most famous places besides the Asakusa Kannon temple. Here you can also find the tomb of the emperor Meiji. The beautiful buildings and gardens are a popular place to go for Japanese and foreigners as well and a favorite `marriage temple`. We were lucky to witness this young couple after the ceremony. The uniform of the Shinto-priests reminded us of a costume from an older StarWars-episode. 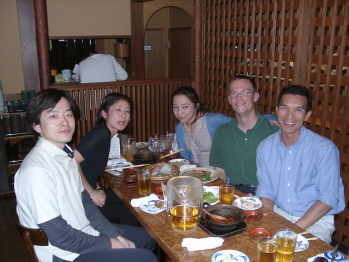 Back from Meiji shrine we were hungry once again. Today it was definitely time for Kaiten-Sushi, the Fast Food version of raw fish. 3) Finish 5 - 6 plates in max. 10 minutes, 10-12 plates in max. 20 minutes. For free tea take a cup, a tea bag and hot water (see left). The time limit forced us to start eating right away. Five Sushi chefs produced the little ricedishes in an assembly line fashion. 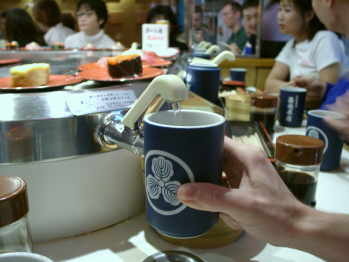 The Sushi conveyorbelt ran with many curves through the restaurant to serve about 50 customers with this japanese specialty. 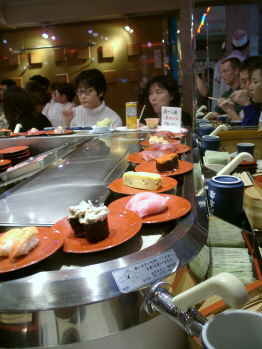 Kaiten-Sushi is about as popular for japanese as McDonalds is for Americans. The low price of 100 Yen (appr. 1 US-$) per plate with two pieces of sushi ranging from shrimp and tuna to different types of clams and egg-omelette is only profitable when sold in big quantities. 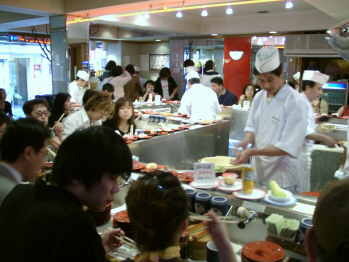 The restaurant was visited by many young japanese as it is one of the most famous Kaiten-Sushi restaurants in Tokyo. As we explored Shibuya we noticed a commons species of young ladies. Many of them with blond (or red-brownish) hair and a height of appr. 5`8 feet their appearance was almost european. After a closer study we found more similarities amongst those girls. They uniformly dress with up to 10 inch high heeled boots, Louis Vuitton bags or backpacks, heavily applied makeup with glitter over the eyebrows and bared a lot of skin. While such girls would probably be categorized as party-chicks elsewhere, they seem to be very hip in Japan. 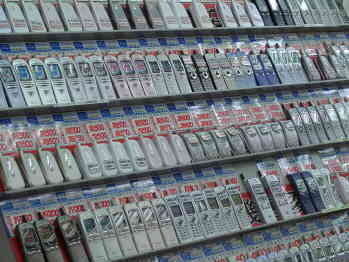 We also concluded that the mobile phone is a very important tool for young japanese. Without their mobile, they would not be able to socially interact any more. On every street corner, in every train and almost all stores and restaurants several teens and twens are busy talking on their mobile or writing short messages. Eventhough this is a trend we also experience in Germany nowadays, japanese are well ahead in this respect. All pedestrian signals change to green at the same time and each time hundreds or thousands of people cross the streets in all driections. You are also allowed to cross diagonally - You can not imagine the pedestrian traffic day and night. Actually, we were not the only ones with this opinion - we saw a few other `gaijin` (foreigners) who videotaped this intersection. At this time the daily work of writing the travel report was far from our minds, but reality cought up with us as we arrived at home quite late that night. New impressions and curiosities as a daily Q & A. 8) What is the object on the photo ?